Heliocentric Astrology is one of the most recent additions to our celestial science, evolving as it has with the modern advance of the Sun-centred view of the solar system. This is not a new approach, as the ancients were well aware of the nature of the solar system. The construction of the Great Pyramid of Giseh, with its astronomical alignments and proportions could not be equaled today. The scientific astronomical knowledge necessary for such a feat of architectural design and its successful implementation, certainly prerequisites an accurate and evolved astronomical appreciation. It would have been impossible for such persons to have even for a moment considered the world to be flat. To my mind it is simply arrogance and naivety, on the part of modern astronomers and scientists, to regard those who have gone before us as having less intelligence than ourselves. None-the-less, with the advancement of modern astronomy and the space age, came an abundance of new and accurate information concerning the nature and phenomena within our solar system. And, if we consider astronomy as the prodigal son of Astrology, we begin to appreciate the situation. In order to send rocket ships to other planets, scientists must know the positions of the planets in space both as viewed from the Sun and as viewed from the Earth. Yes Both Heliocentrically and Geocentrically, and this they must know for considerable periods of time in advance. Furthermore the gravitational pulls of the planets must be determined regularly. To measure the ever changing gravitational balances and intensities between the various planets in our Solar System, it is necessary to calculate the relative positions of each planet in the system to each other planet and to the Sun. These forces must be considered before a successful space launching could be achieved. To assess these forces scientists must calculate the angular situations between the planets. This process is called “˜Gravitational Vectoring’ and it is identical to the astrologers’ calculation of aspects to find the gravitational force field around Earth from a specific point on its surface at a specific time”¦.the time of birth. What I am saying is that there is not as much difference between the two sciences as the public has been led to believe. Heliocentric Astrology views life from the Sun. Some astrologers at this point will argue that we don’t live there so the perspective is not valid. I disagree. The Sun, being the source and maintainer of all life in the Solar System is appropriately called the Sol (soul) of the system. If one wants to evaluate life within the Solar System, one must of course consider primarily the Sun. When we take a heliocentric viewpoint, we find out much concerning the basics and fluctuations of the Life principle which will condition our planet. The Sun sends forth its energy in the form of Solar Plasma (or Solar Wind) which moves through the space within our Solar System at exceptionally high velocities, bombarding all planets , stimulating and perpetuating life. The fluctuations of this Solar Wind generate fluctuations in planetary atmospheric conditions of awesome proportions. It is the study of the nature of the Sun that has brought modern science to the heights it has reached – from climatology and weather forecasting to space travel. Fluctuations in the Solar Wind are revealed in advance as magnetic storms and sunspots on the surface of the Sun. These solar eruptions interact with, and generate tremendous magnetic storms and disruptions of proportionately similar intensities within the magnetic field of Earth and of other planets. The actual manifestations of this solar magnetic energy is perhaps unfathomable as it is the essence of life. It controls weather fluctuations and therefore crops as well; and since man has a magnetic aura around him that is completely conditioned by Earth’s magnetic field, the influence of Solar Plasma and its changes on our nervous system cannot be underestimated. One of the first outstanding discoveries concerning sunspot activity and its subsequent influence, was the effect on radio and telegraph transmissions. Whenever there was major Solar activity shortly afterwards there would be much static and interference on radio frequencies. The research of John Nelson of R.C.A. Victor revealed that the source of radio interference was the Sun and that to avoid it, transmissions must be relayed around the far side of the Earth. Nelson’s research further revealed that the phenomena of Sunspot activity was intricately and inescapably linked to the magnetic and gravitational force fields created by the planets and their ever changing interrelations or patterns. Whenever several planets would align themselves with the Sun or at right angles to each other from the Sun, increased Solar activity was the result. The greater the alignment, the greater is the solar activity. It was the study of Solar winds that justified the initiation of most of the earlier unmanned space ventures. The intensity of Solar winds had to be known before manned space flight could happen, as direct radiation from Solar storms could too easily be deadly outside of Earth’s protective shield. The thought that the planets and the Sun have no effect on life on Earth or on Man, at this point becomes absurd. Further research has shown that the changes in the gravitational balance of the Solar System is the source of most seismic activity. The study of planetary alignments and patterns is now allowing an advanced understanding of earthquakes and the timing of their occurrences. This is really obvious as the two outermost planets in our Solar System were discovered by the disturbing effect they had on their inner neighbouring planet. The gravitational force field of Neptune caused significant perturbations in the orbit of Uranus, as did Pluto on Neptune’s orbit. If a body as large as a planet can be pushed out of its usual orbit by the proximity of another planet, how could it possibly be immune from resulting seismic disruptions in earthquake sensitive areas? Any direct alignment of a planet with any other, or with a sensitive point in the magnetic and gravitational force fields affecting either planet, has a definite influence or effect. In Heliocentric Astrology, the calculation of planetary alignments is no different than the calculation of planetary aspects with the exception that they are assessed with special attention to both the Sun’s viewpoint and that of the Earth. Planets are aligned if they form aspects of 0º, 45º, 90º, 135º, and 180º. Remember that a geocentric square (90º) may not be a square from the heliocentric viewpoint. Intense alignments to Earth would centre its effects on Earth specifically. Intense alignments to the Sun would centre its effects on the Sun and in turn emit to every planet via disturbances in the Solar Wind. Each planet would receive the effects according to its own specific orbital, magnetic, and gravitational positioning at the time. So the effects on each planet would differ with differing vulnerabilities (and seasons). Within the Solar System there are numerous sources of magnetic and gravitational sensitivity. Each source adds a different dimension or typing of vulnerability. Each dimension of Vulnerability has 2 primary points, 2 secondary points, and 4 tertiary points of sensitivity, making in all 8 heliocentric sensitive points. To keep this article within the confines of this magazine we will primarily concern ourselves with effects to planet Earth. First we must consider and qualify the magnetic vulnerability points of influence on the actual physical gravitational field of the planet. The planet will experience the effects of each of these 8 points in sequence throughout the completion of one orbit. The may be a time lapse between an effect at one sensitivity point and its result on the planet. If some influence occurred at a specific point of vulnerability then it would likely manifest itself most noticeably when the orbiting planet reached that point. The intensity weakening in direct proportion to the amount of time necessary for the planet to reach that point. So here there could be a double influence or a time span of influence. The first of these orbital influences that must he considered is that of DISTANCE. Planetary orbits are not circular, they are elliptical. In simple terms this means that one extreme of the orbit is closer to the Sun than the other. When a planet is closer to the Sun it is more directly vulnerable to the intensity of Solar radiations, wind, and storms. When the planet is closer to the Sun it also moves faster angularly, which explains the fluctuating speeds of a plan within its orbital timings. Obviously this would have its effect on the duration of a planetary alignment. The closest point to the Sun in an orbit is called Perihelion. The farthest point from the Sun is called Aphelion. These are the 2 primary points of distance sensitivity. When farthest away the vulnerability to Solar radiation is lessened. When closest to the Sun a planet is also more likely to stimulate Solar magnetic storms and disruptions, and this in direct proportion to the weight of the planet and its distance to the Sun. At the most distant point (aphelion) , this extremity could still trigger critical Solar eruptions. The 2 secondary points are the angular mid-points to the extremities. These points are potent and vulnerable and can’t be underestimated. The 4 tertiary points are subtler and somewhat less intense. Due to the unequal and vast distance of each orbit from the Sun and each other, it would not be possible to place them on a conveniently sized chart form proportionately. Consequently in Heliocentric astrology the planets are placed angularly from the Sun in their exact position, and in the appropriate concentric circle sequentially from the Sun. Thus there is an angular distortion when viewed from Earth, especially with reference to the outer planets of Uranus, Neptune, and Pluto. The orbits are drawn circular around the Sun. (see above diagram).This presents a visual distortion which will show in the differing velocity of a planet travelling through the various sections of its orbit. A correct heliocentric ephemeris will not assume that a planet will move at a uniform rate through each of the 360 heliocentric degrees of its orbit, for such is definitely not the case. The heliocentric distance factor gauges the very direct and concrete interaction between a planet and the Solar Plasma or Solar Wind. There is a pulsing effect here. The planet gives and takes; it triggers and causes effects, and then reacts or is vulnerable to the results. (Not unlike man in his environment). The nodal axis of a planetary orbit marks the 2 points where the orbital planes intersect each other. When a planet in its orbit is on the nodal axis then it is exactly on the same plane as the other planetary orbit which the node refers to. At such a point the magnetic and gravitational influences of this planet are at an extreme. The planet at the node in its orbit exerts its most direct and potent influence magnetically on the orbit of the other planet and gravitationally on the other planet itself. it would also receive effects as such exchanges of energy are mutual, however one planet may be more vulnerable in its timings and position than the other. Basically I think that when a planet is at its orbital node to another planetary orbit it is the sender, and when the other planet is at the same node it sends energies back. The north node ( ) is the point of orbital intersection where the planet would be moving into the North Hemisphere of the orbit. At the South Node ( ) the planet would be moving into the Southern Hemisphere of the orbit. In this article all the planetary nodes refer to Earth’s orbit. The dotted arrow will reach to the orbit of the planet whose nodal axis it is. The arrow point of the North Node is the point at which that planet would rise into the North Hemisphere of Earth’s orbital plane. The nodes are the 2 primary points of sensitivity. The midpoints to the nodes are the 2 secondary points. The nodal Midpoints reveal the orbital point at which the planet in its orbit is furthest (in latitude) from the orbital plane of Earth. At the planetary midpoint (nodal) , the planets influence is most remote on the gravitational field of Earth and yet still extreme and disturbing on the magnetic field of Earth’s orbit. The 4 tertiary points are subtler, less intense and less defined. The effect of orbit to orbit is magnetic. The effect of planet to planet is gravitational. The effect of any planet to the Sun affects the whole Solar System. A gravitational focus can and does affect a magnetic plane, and likewise a magnetic plane can affect a gravitational focus. The third major consideration is the phases of Axial Inclination. Here we begin to see how a specific planet reacts to and translates the heliocentric energies and forces into a dynamic rhythm of life impulses and seasonal patterns. This area is most familiar to the astrologer as it represents the Tropical Zodiac. What is revealed Heliocentrically that is not considered geocentrically is (among other things) that each planet has its own axial inclination, its own four seasons, and therefore its own Zodiac having the same 12 Tropical Signs but of differing time duration and differing seasonal extremities. Here is the astronomical key to the weather on each planet. The weather and climate are natural adjustments to and participations in the Life of the Solar System. It is very important astrologically, to know the season that a planet is experiencing in its own orbit. The seasonal timing of a planet represents the character or nature of that planet at that time. In other words the season of a planet may well be a more accurate gauge or at least a valuable addition to the assessment of a planet’s character in an individual horoscope. It took considerable research and study and many letters to find the Equinoxes and Solstices of each planet. And it is with thanks and gratitude to the Royal Astronomical Society of Canada, the National Research Council of Canada, and the National Aeronautics and Space Administration of the United States of America, for the final accumulation of this information. Each planet in the Solar family has its own Heliocentric Zodiac aligned with its Equinoxes and Solstices (axial inclination or seasonal reactions). In this article however we are taking the view as relevant to life on Earth. The Heliocentric Zodiac that I use is an inversion of and basically still a Tropical Zodiac. In the Heliocentric Zodiac, Earth is always in the opposite degree and sign of the Sun’s position in the Geocentric Tropical Zodiac, so that when the Sun enters Aries, Earth enters Libra. 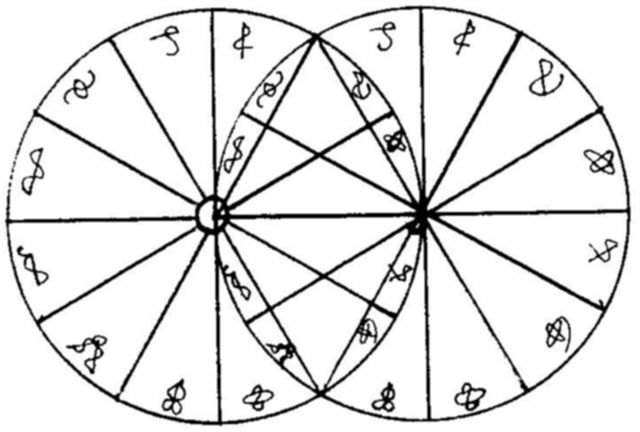 The translation of this Zodiac into the Sidereal Zodiac if desired is the same proceedure as with the translation from Geocentric Tropical Zodiac into the Sidereal : for March 21, 1976, subtract 24º24’42”. Also to avoid confusion due to Helio or geocentric viewpoints, wherever a heliocentric planetary symbol is used it will be encompassed in a circ1e. 4 Tertiary Points: 215º, 305º, 35º, 125º. 4 Tertiary Pts: 154.9º+, 244.9º+, 334.9º-, 64.9º-. A planet has its greatest influence on Earth when it is conjunct the orbital plane of Earth, ie. when it is conjunct either node. A planet has its least influence on a planet (EARTH) when it is at a maximum distance North or South of the orbital plane. It is important to note that when a planet is at its maximum North or South Latitude from the orbital plane of Earth, the resulting lessened intensity from that planet is still quite noticeable and important, and it must be taken into consideration – lessened intensity is a very potent form of influence. Tradition tends to make contacts with the North Node more positive than with the South Node, however I tend to place an equal emphasis on each – the increased intensity being not necessarily positive or negative in itself. One would have to consider the planetary angular alignments (aspects) to the specific planet in nodal position to determine the subsequent positive and/or negative results. A planet situated on any one of the 8 nodal sensitivity points of any other planet (Earth in this article) throws its significant added influence to the other planet (Earth). This planetary influence via the nodal points is MUTATED by the nature of the planet whose nodal point it is. For example: if Uranus is on a Saturnian Nodal Point then the Uranian impulse for radical change and independence would express itself in a self controlled, responsible, or limited manner. On a Martian nodal point Uranus’ impulse for radical change would gain assertive force. When a planet conjuncts perihelion it is closest to the Sun. At aphelion it is farthest away. At perihelion a planet most directly affects and receives effects from the Sun, – for better or worse depending on the planetary alignments to it. At aphelion the interplay is lessened. Certainly a planet astrologically will affect your Sun (or Life Purpose) to a greater extent if it is at perihelion and to a lesser extent at aphelion. Likewise at perihelion an outer planet (Mars and out) can come much closer to Earth as well – it can, although not necessarily so. Such would be the case if Earth at the time were at a more distant sector of its own orbit. The closer the planet to Earth, the more direct, intense and stronger the influence. The influence of any planet in conjunction to any one of the 8 planetary distance sensitive points will be mutated and will add extra significance of the nature of the other planet whose sensitive point is touched. This mutation relates to the Sun. There is a strong distinction here when we observe the inner planets of Mercury and Venus. With Mercury or Venus at perihelion the Sun or Soul purpose of your life will be strongly affected, however unlike the outer planets at perihelion, effects of Venus and Mercury are more likely to be further from the Earths orbit. With Mercury or Venus at Aphelion the increase of intensity will most likely increase effects on Earth and at the same time lessen effects on the Sun. Each planet has its own seasonal factors based on its own specific axial inclination and angular direction in which the axis inclines. Each planet has its own Equinoxes and Solstices. In other words each planet has its own Tropical Zodiac. The season of a planet at any moment certainly influences (or represents) the nature or character of its expression (astrologically). For example: A cold wintery Mars will manifest distinctly different from a Spring Mars, which would again differ from the nature of Mars in its own Summer. Here in the seasonal factors we encounter the intrinsic nature of a planet’s expression at a specific phase of its cycle. 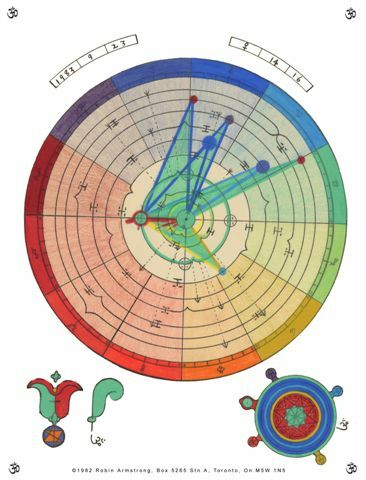 A planet conjuncting any of the 8 seasonal sensitive points of another planet throws its influence into the character or season of that planet whose point it is. 1. Each planet has its own unique character accentuated by its season, and mutated by contacts of other planets to its seasonal sensitivity points. The Aspects qualify the nature of the planet’s functional energies. 3. The geocentric aspects to a planet reveal the Mode of functional operation of that planet to Earth. There are dynamic and non-dynamic aspects. There are also doubly-dynamic and doubly-non-dynamic aspects. The primary concern should be with the dynamic aspects of 0º, 180º, 90º, 45º, and 135º. The smaller the orb the more definite the results. The energy generated by dynamic aspects increases considerably with exact ness of orb. I tend to limit heliocentric orbs to 5º, sometimes I only allow a 1º orb. It really depends on what you are looking for. Geocentrically I am much more lenient and allow orbs between 5º and 10º in some cases. Heliocentric aspects concern the Sun. Geocentric aspects concern the Earth. Heliocentric Astrology is a Gemini Science in that it is two-fold. Many new factors are added, but each factor must be considered in combination with the corresponding Geocentric factor in order to gain an accurate assessment that will add significantly to valid geocentric observations. To consider heliocentric data exclusively would leave the evaluation open to unnecessary blind spots and inaccuracies. To consider both greatly enhances one’s perspective and one’s degree of assessment. Caution is needed so as not to confuse the double-duty-data. 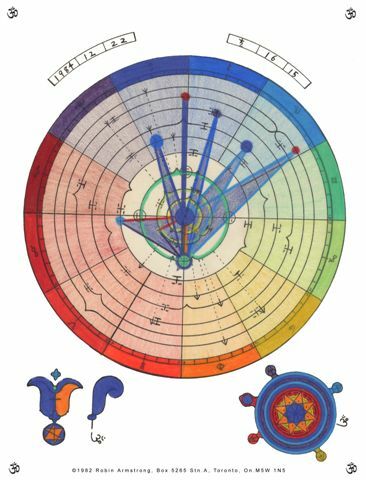 In the Kingdom of Aspects, if a Geocentric dynamic aspect is also a dynamic Heliocentric aspect, then it is Doubly-Dynamic, and works in both dimensions (worlds).If a dynamic aspect occurs exclusively in either the Heliocentric chart or in the Geocentric chart, then it is singly dynamic, exclusively within the corresponding activated dimension. Heliocentric aspects have a double effect: one between the two planets concerned, and the other on the Sun’s surface in the form of Magnetic disturbance. When two planets are in Heliocentric conjunction, they are as close as they can be to each other. (This distance is subject to fluctuate from one conjunction to another with respect to the orbital distances of each planet – ie. near perihelion or aphelion). This means that in the Heliocentric conjunction, the 2 planets affect each other most intensely, so much so there would almost be a magnetic repulsion between them or a gravitational attraction. Whenever Earth is in Heliocentric conjunction with a planet, that planet will be retrograde Geocentrically. If it is an outer planet it will be in Geocentric opposition to the Sun and retrograde, if an inner planet it will be Geocentrically conjunct the Sun and retrograde. The direct geocentric conjunction of the inner planets to the Sun are Heliocentric oppositions to the Earth. The first prerequisite of Heliocentric Astrology is that one is capable of distinguishing between Solar factors and Earth factors, and the different implications of each. In Heliocentric Astrology the house considerations become insignificant in the light of the new Earth view. The SUN in Geocentric astrology is the main Light and refers symbolically to the radiance, the aura, the vitality, the Life Purpose of the incarnation, or the SOUL Purpose. It seems more than coincidence that the Sun is called Sol. The Sun is the source and maintainer of all life It is the Soul of our planetary system. In the light energy of the Sun, the whole Solar System is ONE BE-ing. This One Being is the Life Purpose of the Solar System. When we come down to Earth, we encounter all the petty differences and distinctions among Humans (and other forms of life on Earth). Everyone and everything is materialistically different. No two bodies or things are exactly the same on Earth (nor on any other planet). Each thing has its own separate nature and place in the scheme of things – its own unique body and potentials – and its own Earth-centered separative, materialistic, EGO. The Earth is orbited by its one satellite, the Moon. The Moon, physically is part of or is captured by the Earth system. It holds an influence over waters on Earth, and humans, being for the most part composed of water are greatly affected by Lunar Tides. Symbolically the Moon rules the instincts, the moods, the mother, the ancestry, the memory, one’s feelings and sympathies, as well as one’s basic habits and basic needs. Heliocentrically the Moon becomes overlooked as a part of the Earth consideration. (However, New Moons and Full Moons need to be considered from the Geocentric view point). In other words, before we can perceptively appreciate the Heliocentric Chart, we must be able to rise above the petty differences of materialistic Earth life, and above our ancestral attachments, prejudices, and/or distinctions. To appreciate the Sun one must be one with the Soul. One must see one’s own EGO in its true perspective in the light of all difference being part of One Life centered for all in the One SUN. 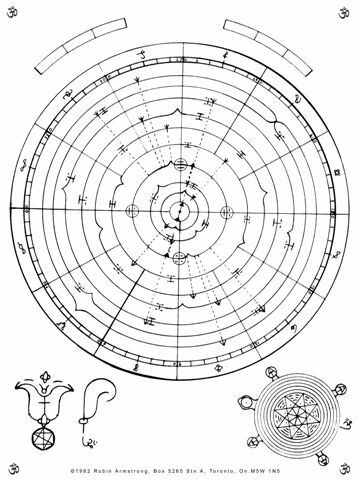 All beings on all planets have the Heliocentric chart in common, as the nature of their Soul. No one being has a separate Soul – in Sol, we are all ONE – and working for the same SOL Purpose. The Geocentric chart is the separative materialistic nature that we must conquer and rise above. 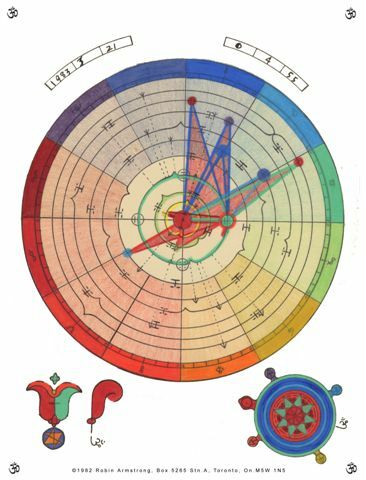 The Heliocentric Chart reveals the challenges of the Soul. Both charts function fully, either consciously or unconsciously. Many consciously chose one path exclusive of the other and do not embrace the greater challenge and subsequent greater reality. All is as it should be and no doubt the Universe is unfolding as it should; and whether we in our separative Egos can see it or not “¦”¦ WE ARE ALL ONE “¦”¦.IN THE SUN. Once this basic distinction is fathomed, we begin to see the various forces that impel one towards Soul or towards separativeness and materialism. This is what Heliocentric astrology can reveal. We can find within ourselves basic challenges and confrontations between these two dimensions “¦”¦”¦. between our higher and our lower natures. An in depth study of the above diagram and its implications will prove very rewarding. A line is drawn between the Earth and the Sun. Parallel perpendicular lines are then drawn through the Earth and the Sun. The 180º area of space on the side of the Earth away from the Sun, relates definitely to the material, separative, EGO side of existence. The 180º area of space on the side of the Sun away from the Earth relates definitely to the Unity oriented, Soul side of existence. 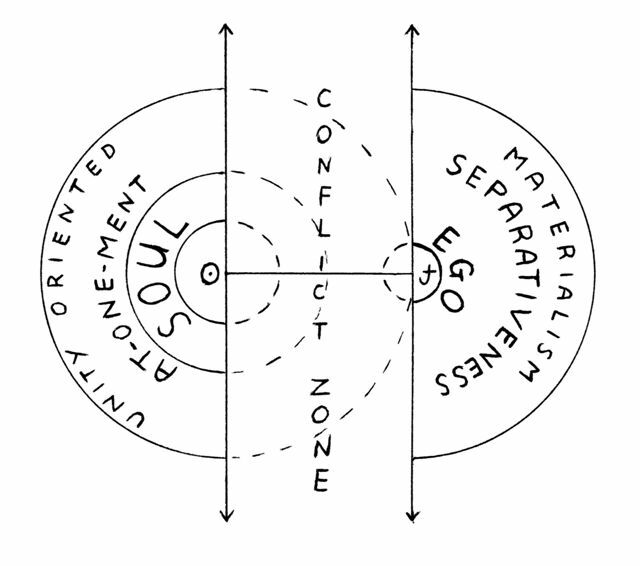 The Conflict Zone between the Sun and the Earth is the area where we experience life confrontations in the marriage between Ego and Soul. And as many of us know, marriage can be a field of irresolvable tensions and frustrations. Marriage can also represent a field of experiential depth and fulfillment. It all depends on which focus you chose. The choice is yours “¦.or is it? The most readily distinguishable influences in the Soli-Terra Conflict Zone are Mercury and Venus (and also the Moon). These are the two planets inside Earth’s orbit. They refer to our inner faculties of mind and emotion. If Mercury is between the Sun and the Earth at birth then it becomes necessary for the person to use their mind to find, to get to, and to experience their (spiritual purpose) SOUL. The above will always be the case but not exclusively so if Mercury is retrograde in the Geocentric chart. If Mercury is on the far side of the Sun one must find one’s Soul or Main Purpose in life before Mercury will work properly. The mind will be directed from the Soul, not the Ego. But even if Mercury is in the conflict Zone it does not necessarily mean that the mind will be more materialistic, rather it means that there will be times of decision usually precipitated by inner conflict. If Venus is between the Sun and the Earth at birth then emotional experiences will lead one to the Soul but not without a gravitational pull from the materialistic Ego Earth. If Venus is on the far side of the Sun , one will have to find one’s Soul before one’s emotions can be properly used. Emotions will be directed from the Soul (SOL). The spiritual light of the Stars can and do manifest through Soul (Sol) and also through materialism and Ego, and also through both. The Moon can’t reach the far side of the Sun, but it can come in between the Earth and the Sun, between the Ego and the Soul. Perhaps this would be the case when one’s family or feelings, or habits interferes with one’s path to the Soul – especially during Solar Eclipses. When referring to the Heliocentric Charts with reference to the above diagram, please remember that there is a distance distortion with the outer planets. The outer planets may appear to be in the conflict Zone, but due to their great distance away they are not. This requires extra calculation to determine. Any Geocentric aspect that is less than a Square(90º) to the Sun will be in the Conflict Zone. Any Heliocentric aspect that is less than a Square (90º) from the Earth will be in the Conflict Zone. As with the Aspects, the Geo-Helio Zodiacal considerations present us with Double-Duty-Data. The Geocentric and Heliocentric Zodiacs are basically the same – they stand on the same foundation of Equinoctial and Solsticial division – however because Earth moves around the Sun and is not central there is a distortion between the two. This distortion stands out most distinctively with the inner planets o Mercury and Venus. Geocentrically Mercury can only be at the most 28º on either side of the Sun (not more than one sign away), and geocentric Venus can only be a maximum of 48º away from the Sun (not more than 2 signs away). Heliocentrically Mercury and Venus can be in any of the 12 signs irrespective of Earth’s position; and the moon must stay very close to Earth. one materialistic tone and one Soul tone. To consider one planet specifically, one must contemplate its dual tone and subsequent implications and perhaps conflicts. With Mercury or Venus it is possible for the Dual-Tone to be in opposition or square or trine etc. This reveals the ability to function or interrelate between dimension of Soul and other of Ego, between impulse to unity and impulse to separate. Each outer planet will for the most part be of the same tone in both charts, except when nearing a cusp. One further comparison with regard to the movement of the planets both Heliocentrically and geocentrically (ie. 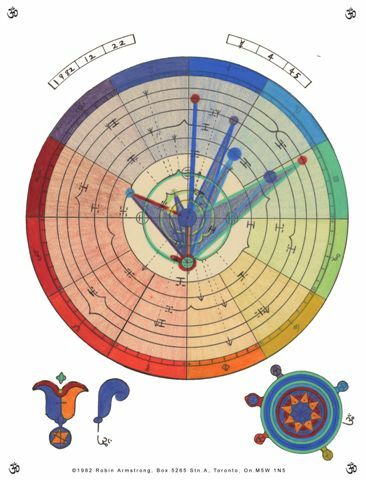 the transits). Geocentrically due to Earth’s orbital movement a planet can transit across a specific degree 1, 2, 3, or more times with a back and forth sway. Heliocentrically a planet can transit a specific degree only once in an orbit. If the degree is a crisis oriented one, then geocentrically there will be 3 or more crisis times. Heliocentrically there will be only one crisis and this is often at neither of the Geocentric times. If we list the times of both the Geo and Helio crises, and mark the Helio time special, we notice: The helio crisis will reveal the inner peak of the crisis .The Geo would represent circumstantial situations and buildups. 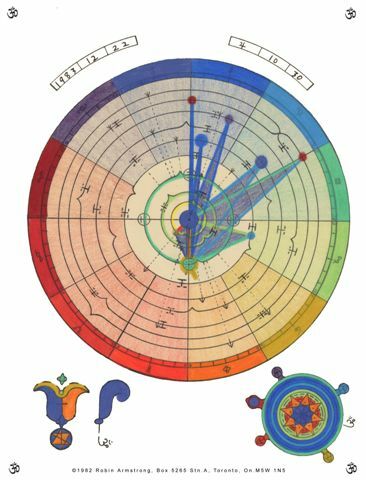 Below is included a blank Heliocentric chart form, designed by myself, on which you may place your own heliocentric birth data. Any opinions, additions or revelations that the reader may be inclined to convey are welcome. Rather than present you with a person’s heliocentric chart (which is exceptionally personal), I will present you with 10 Heliocentric charts for the period of 1982 to 1984. In this period all the planets in the Solar System align themselves within, well within, a 90º section of the Zodiac. Such an intense alignment has not occurred and will not reoccur in over 500 years. The implications of this time are awesome and the potentials tremendous.